The last decade started out so well for the Packers. They made the playoffs in each of the first eight years, including a 2010 Super Bowl title and five division titles. You’d probably take the Patriots’ run over the Packers’ in that span, but not by much, and maybe not even them. The last two years have been much less exciting. The team has had a losing record with a third-place record each of the last two years, the first time the team has had records under .500 in two consecutive years since 1990-1991. The good news for the Packers is that the primary driving force of their success — a certain quarterback we’ll be mentioning just a few words from now — is still around in Green Bay for the foreseeable future. We’ll have to see if the team can make a return to the successful ide of things in 2019 or beyond. Let’s take a look at the best Packers fantasy seasons of the last decade. 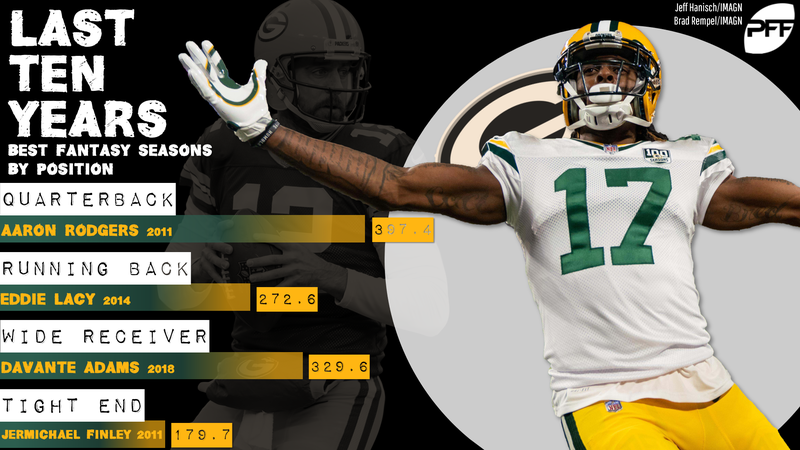 Rodgers has had two seasons at fantasy’s overall QB1 inside the last 10 years, and another three were he was QB2 in addition to 2011, but it was his second-place finish in 2011 that set the mark for the Packers, a top-five fantasy season of all-time. But perhaps the most impressive thing about Rodgers’ career is that, after 13 and 11 interceptions in his first and third seasons as a starter, respectively, he’s now gone eight straight years with single-digit interceptions thrown, which feels like it should be nearly impossible. The Packers haven’t had a lot of dominant rushing production over the Rodgers run, but it looked like they had found their guy in Lacy, who put up the team’s best backfield season in a long time in 2013 and then topped it with his 2014 run. We don’t actually know that it was Lacy’s weight issues that ultimately pushed him from the league, but it certainly seems like it. But in 2013-2014, only a handful of backs managed more combined points than Lacy. On the flip side of the middling backfield production, the Packers have had no shortage of big-time receivers throughout Rodgers’ run, with Jordy Nelson, Randall Cobb, Greg Jennings, and James Jones all putting up big numbers. But it was Adams, just last year, who had the best year, and he did it in only 15 games. Adams was the season’s WR1 entering Week 17, but the combination of an injury and a meaningless run-out-the-string game for the Packers meant that he didn’t even see the field. Still, it’s pretty clear the Packers are set at at least that position. True story: I once wrote a thing in which I compared Finley’s career to the character arc of George O’Malley on Grey’s Anatomy, and it’s a comparison I stand by today (I’m not gonna rehash it here; @ me). Finley perpetually looked like he was on the cusp of greatness, but he always fell just short and finally injury more or less ended things for him. But with the Packers generally struggling to get dominant tight end play over the Aaron Rodgers tenure, Finley’s 2011 ranks as No. 1, and he has three of the top four seasons over the last decade.